Let me apologize in advance if this gets too long/emotional/boring. These recaps are mostly for me to have something to look back on and see what I did wrong or right and to improve in the future (or remind myself to never train for a marathon again - only kidding...sort of). Also, there are some bruised foot pictures at the end so just prepare yourself for that if you are weird about feet. They're not terrible and I don't have black toenails. This has been a tough week for me. Looking at our training schedule, this past week had us running our maximum weekly mileage (36 miles, which is one more mile than the week we do a 20 mile long run). So really, it's no surprise that I would have a rough week. I mentioned last week that I really didn't like running 3 days in a row. I really appreciate all of your comments and suggestions. I haven't really decided what to do about it yet and I don't feel like I can switch training schedules this late in my training. I may in fact alter my weekly schedule to only run 2 days during the week and do more cross-training on the bike. Thoughts? This week I decided that instead of 5-8-5, I'd front-load my mileage to get it out of the way and do 7-6-5. It's the same number of miles, but by doing that I thought it would be mentally easier to have something to look forward to the next day (today's run is easier than yesterday's!). I used this as my rest day. I was pretty tired from my 17 miles. Rode 16.76 miles in 1:09 (14.5 mph) with Andrew. I love being able to ride with him. It was a little cool outside but it felt nice! Ran 7 miles in 1:10 on the treadmill (10:00 pace). This was actually a good run on the treadmill. I did it after dinner, which is always questionable, but I was okay! I stopped once after 2 miles to go to the bathroom but when I got back on the rest of the run went really well. As you can see, the week started out okay, but on Wednesday I was tired. I stopped my run early because I was stressed out. I was stressed about marathon training, stressed about my job (I've been in a new position for 9 months and I have days when I feel like I have no idea what I'm doing), stressed about having to spend $1,000 on vet bills for my sick kitty (he's doing okay now! ), stressed that the vet wanted to schedule a follow-up appointment during my long run and my husband couldn't take him either (I got the appointment moved! ), stressed about being tired and not getting enough sleep (still working on that one), and stressed about not getting to spend as much time with my husband as I would like (because of all these other things listed - still working on that one too, but I am so thankful to have the most understanding husband who is so supportive of my training). I was running on the treadmill on Wednesday, hoping to get in 6 miles. At mile 3 I just gave up. I actually got off to go to the bathroom and I just never got going again. Physically I felt okay, but not spectacular. After 3 miles it was already past 8:15 PM (supposed to go to bed at 9!) and I just felt like I needed to be at home taking care of things in order to feel less stressed. So I left! Later on right before I fell asleep I ended up having a little break down that involved crying, but my husband consoled me and made me feel much better about things (he's so good at that!). Sometimes I just need a good cry to make myself feel better. I hope I'm not the only one (Mom, if you're reading this, I PROMISE I'm okay!). My run ended up being 3.04 miles in 32 minutes (10:31 pace). I was debating making up the mileage the next day but I decided just to move on. Sometimes that's best! I tried to look at Thursday as a new day and thankfully I was running with my amazing running partner and that always seems to make a run 100 times better! I forgot my watch so I tried to use the Map My Run app on my phone, but apparently I paused it as soon as I put it in my running belt, so I really don't have an exact time. I know I ran about 5 miles and it probably took about 55 minutes. At this point in the week, I really didn't care how far/fast I went. There was some walking involved, but we both needed it! During our run, I came to find out that we were both having the same thought of, "I AM NEVER TRAINING FOR ANOTHER MARATHON AGAIN...IT'S CONSUMING MY LIFE!". Sometimes knowing that someone else is going through the same thing makes it easier to go through yourself. We both feel like all of this training will be "worth it" when we cross the finish line, but training for a marathon is such a huge time commitment when you have a full-time job and a life (okay, I really don't have much of a "life", but still). Thankfully I know that this is only temporary and in the end it will be very rewarding! It's also obviously physically demanding and it's not like you can run 18 miles then go do a million other things the rest of the day (maybe some of you can, but I sure can't). Anyways, it was a relief to know that I wasn't the only one dealing with being stressed out about training. Ran 8 miles in 10 minutes. HA - JUST KIDDING! I rested. Really? Me not rest? After this week? I don't think so. Looks kind of bad, doesn't it? Less bad, but still a noticeable bruise. It didn't hurt to walk, but it hurt when something (like a shoe) would touch the top of my foot. I made the mistake of Googling "pain and bruising on the top of my foot" and I start thinking that I have a stress fracture and freak out that my first marathon will be a big fat DNS. If I am truly hurt, that's okay, although I will be devastated. For now my conclusion is that my shoes were laced too tight or incorrectly. I found these videos from Runner's World, so clearly this is a common enough problem! On Sunday the bruising had gone down; it was a bigger splotch and a lighter red color. Today (Monday) my bruise is completely gone. I can fully support my weight on my toes and it doesn't hurt to walk. It still hurts a tiny bit if I put pressure on the spot where the bruise was though. I ran in these shoes during my 17 miler, and while I had some toe pain on both feet, I didn't have this bruising on the top of my foot. I don't know if it's the actual shoes, or if I just had one of them laced to tight, or if it's something totally different (please don't say it's a stress fracture, please don't say it's a stress fracture...). My plan is to take it easy this week (biking instead) and run again on Thursday (maybe) and Saturday to see how I feel. Thankfully this is a cut-back week and I have never been so excited about only running 13 miles in my life! If it still hurts after changing my lacing, I'll go to the doctor. Anyone ever have this problem or have any suggestions? Again, sorry for the lengthy recap...if you made it to the end you should get a prize! First, sorry for being MIA from the blog the past week...I'll get into why in my next post, but first I just wanted to make it up to you all with some Pumpkin Chocolate Chip Cookies. Okay, sorry...not actual cookies, but a recipe for some! It's not the same, I know! This recipe comes was adapted from this recipe I found on www.allrecipes.com. I changed it around to make them healthier so that I wouldn't feel so guilty about eating one a few of them all of them. Combine the pumpkin*, brown and white sugar, vegetable oil, applesauce, and egg. In a separate bowl, stir together the flour (all purpose and whole wheat, or completely all purpose), baking powder, ground cinnamon, and salt. Dissolve the baking soda with the milk. I thought this was sort of a weird step but I did it anyways (i.e. I'm not sure of how significant of a step it is and I don't know that much about baking and I wasn't about to screw this recipe up). Pour this into the wet pumpkin mixture. Pour the flour mixture into the pumpkin mixture and mix well. Add the vanilla and chocolate chips. Drop spoonfuls onto a greased cookie sheet and bake at 350 degrees for about 10 minutes (you won't be able to tell that they are "browning" but they will become firm). This recipe makes about 30 cookies, depending on how large you make them (I don't skimp!). I plugged the ingredients into My Fitness Pal and came up with about 120 calories per cookie, 3.8 grams of fat, 20 carbs, and 10 grams of sugar (compare to a Kroger Bakery Pumpkin Chocolate Chip Cookie which has 240 calories, 10 grams of fat, 36 carbs, and 21 grams of sugar...that means I can have two of mine, right?). Most of the calories come from the chocolate chips, and you will probably never hear me say this again, but I think the cookies have a little too much chocolate in them and it overpowers the flavor of the pumpkin. So maybe next time I will reduce the amount of chocolate chips and see how it goes. They are still definitely delicious though! I find these particularly yummy when they are cold, so I store them in the refrigerator. Let me know if you try them and how you like them! *A can of pumpkin has about 1.5 cups of pumpkin. If you're looking for an idea for something to do with the last 1/2 cup of pumpkin, try making a pumpkin smoothie! Only 8 weeks to go! I would describe this past week as alright. Synopsis: I didn't get my cross-training in on Sunday/Monday and I was sad that I didn't get to ride my bike. Tuesday's run was good. I felt terrible after Wednesday's run (although the run itself wasn't too awful), and I was mentally and physically defeated by a 4 mile run on Thursday. Saturday's 17 miler went really well, but I'm pretty tired right now. I'm heading into the peak mileage week next week (36 miles) and I'm just a little worried about getting fatigued and not having good runs. I don't really like running 3 days in a row during the week. I understand that I'm training for a marathon and I need to build up my legs, but by the time I get to Thursday's run I'm too tired to care enough to make it a good run...which leaves me asking myself, "what's the point?". For example, this past Thursday I was supposed to run 4 miles. After 2 miles I called it quits; my toe hurt, my back hurt, I was tired, and I didn't want to be out there running. So I stopped at 2.25 miles (25 minutes). If I had been biking, I probably could have gone for at least an hour. I obviously prefer running only 2 days during the week (with a long run on the weekend), and being able to do more cross training (2 days of biking). But again, I don't know if that would hurt me or help me. Since Sunday was a rest day this was intended to be a cross-training day. I was just so excited about getting my new furniture that all I wanted to do was sit on it!! So I did. Can you blame me? (note: our old furniture was my parents' 30+ year old This End Up furniture that has, to put it nicely, been around the block a few times. After being married for 3 years and with my incessant complaining about how much I didn't like it, we finally got new furniture). I love my new furniture! Ran 4 miles in 38:20 (9:35 pace) on the treadmill. I started my run at 6 mph and gradually increased my speed and ended at 6.7 mph for the last 1/4 mile. It was a progression run, but with no real rhyme or reason. I felt pretty good about this run. Ran 8 miles in 1:22:52 in a hilly neighborhood (719 feet of elevation gain, 709 feet of elevation loss) (10:21 pace). It was HOT. Even though I walked 3 times, I pushed myself pretty hard (maybe harder than I should have). My usual pace for this neighborhood with the hills is closer to 11 minutes/mile. When I got home I made the mistake of not eating anything right away and after I had showered I felt like I was going to vomit. Not cool. Ran 2 miles and walked .25 miles in 24:34 (10:54 pace) outside. It was nice and cool out and my plan was to run EASY. After about a mile I just started to feel tired. Then my toe started to hurt, my back hurt, and I wanted to go home and curl up on my new couch. After 2 miles, I was defeated. I gave up. I began to wonder how in the world I would run 17 miles on Saturday. I was defeated both physically and mentally and I'm not really proud of it. It took some pep talking when I got home to make myself feel better. I was reminded that we're not defined by our bad runs because we all have them every now and then, and it's okay! Rested! We actually ended up having to take our cat to the emergency vet on Thursday night because he wasn't going to the bathroom and was obviously in a lot of pain. He ended up having a urethral obstruction, which can become deadly if it isn't treated quickly. We didn't get home and to bed until almost midnight. On Friday morning I had to pick him up from the emergency vet and take him to our regular vet, where he still is and will be for a few more days. He should be okay, but I sure do miss him! Yes, I know this has nothing to do with running, but my point in telling you this was to let you know I was very glad Friday was a rest day! Another thing that's not unusual to see while marathon training? Loads of unfolded laundry. Can anyone relate? Sorry I've been slacking with the recipes. This blog is supposed to be a mixture of running and cooking/food, but I feel like it's mostly about running. Oh well! This recipe is in my regular rotation because it's fairly inexpensive, easy to make, relatively healthy, filling, and delicious! It makes about 4-5 servings. Combine diced onion, can of undrained tomatoes, cream of mushroom soup, and spices in a bowl. Pour the sauce over the chicken and lift the chicken slightly to allow some of the sauce underneath. Bake for about 50 minutes to an hour or until the chicken is done. Serve over rice or quinoa (I prefer rice but in this picture I used quinoa). Just a quick post for all you nuun-lovers out there! 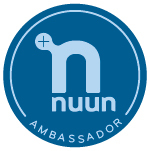 nuun is currently on sale on The Clymb for $14.95 for a 4 pack. It’s regularly $24, so that’s a pretty sweet deal if you’re looking to stock up! There are two options: a box with Grape, Fruit Punch, Strawberry Lemonade, and Tropical, OR a box with Citrus Fruit, Tri-Berry, Orange, and Lemon-Lime. The deal is good for about 3 days or until they sell out, so hurry up! P.S. It’s free to join The Clymb and they have tons of sweet new deals each week. Just click HERE to join! We're half way done already?! I know we still have a few long, hard runs ahead of us, but I can't believe we're already half way through! I used this as my rest day because we had family in town and we were busy spending time with them! We had a busy day after my 15 miles the day before, and we stayed pretty busy on Sunday, too. I was pretty tired all day honestly. I made this my cross-training day since I rested the day before. I wanted to go on a real bike ride, but it was raining. So I went to the gym and rode on the spin class bikes (I feel like they are better than the standard bikes on the floor, plus I don't feel as weird standing up and "climbing" if I'm in the spin class by myself as opposed to out in the open). I don't really know how far I went, but I went for 45 minutes so I'll guesstimate about 11-13 miles. Ran 7 miles in 1:17 (11:02 pace) outside in a hillier neighborhood (635 feet of elevation gain). It was really nice outside thanks to some clouds and cooler temperatures. I was also running in some uncharted territories so there were new things to look at and it made the time go by faster! I also was running with my running partner, which also helps the miles to go by faster. I felt pretty good! I decided to bike for 20.35 miles in 1:27 (14.1 mph pace) instead. It's not that I didn't want to run, but it was so nice outside and I really wanted to ride my bike. I rode with my dad for part of it, then my dad rode with my mom for the rest of the time (she likes to go slower...not a bad thing!). I know I've said this before (but I'm going to say it again to reaffirm it in my own mind), but I really don't think missing a 4 mile run every now and then will hurt me. Sometimes I just need a break from running before I get burned out! This was another cutback week and I was SO thankful for it. It was also beautiful and cool outside so it made for a really great run. We ran 11 miles in 1:56:13 (10:33 pace), and we took 1 minute walking breaks every 10 minutes. To be honest, this run seemed "easy" to both of us and we felt like we should have been doing more! I NEVER thought I would say that about an 11 mile run. This was a confidence-boosting run, for sure. I know I said I would announce the winner this weekend, but I got a little sidetracked because we bought lots of new furniture! I'm currently waiting for it to be delivered (any minute now...), so we spent Saturday shopping and Sunday moving out all of our old furniture! Comment #6, which belongs to Vanessa @ Gourmet Runner! Congrats Vanessa! Send me an e-mail (therunningcook(at)gmail(dot)com) with a mailing address so you can try it out! Endorphin Warrior just launched their 1st Annual Haiku Contest. The first place winner gets a $50 gift card, second place gets a $25 gift card, and third place gets a $15 gift card. You see, I would really really really really love to have one of their leather cord bracelets. I love the way they look and I would love to have an inspirational reminder right where I can see it. I like the "fearless" one because I am just the opposite of that. I know that I need a constant reminder not to live in fear of finding out just what I'm capable of. It can be scary to test your limits or try something new, but generally things turn out okay and you begin to realize your potential. But before you can realize this potential, you have to put your fear aside. You can't live in fear of "what if...". What if I get injured? What if people make fun of me or think I'm weird? What if it's difficult? What if I fail? If you live in fear of the unknown, you'll never know what's possible. I also really like the "twenty six point two" bracelet, in anticipation/celebration of my upcoming first marathon, which will likely be one of my biggest achievements so far in my life and something I’ll be very proud of. They have several other inspirational bracelets (as well as shirts, hats, pendants, and rings) but I think if I had to choose, I'd pick the "fearless" bracelet...but I really do love all of them! I think they look awesome and I’d really love one (have I mentioned that?). Since I’m cheap frugal and they are $48, I decided to enter the contest in hopes of being able to get one. I really used to hate writing poetry in English class in high school, mostly because I thought my poems were terrible. At first I thought this contest sounded lame because I thought I wouldn’t be able to write anything decent. I’m not trying to toot my own horn or claim victory, but surprisingly I came up with not one, but four haikus that I think are alright (although slightly cheesy)! I’m sure other people will come up with much better ones, though. In case there are any other poetry-writing-haters out there who don’t remember what a haiku is, a haiku is a type of poetry that comes from Japanese culture. The most common format (in English) is made up of three short lines. The first line contains 5 syllables, the second line contains 7 syllables, and the third line contains 5 syllables (for a total of 17). For the contest, entries are not limited to that format, but they must be 17 syllables and generally about training, running, cycling, working out, fitness, etc. *After I already entered this one, I realized that “Warrior” actually has 3 syllables instead of 2 (I pronounce it “war-your” rather than “war-ee-or”), so I guess this one would technically be disqualified. Oh well. Maybe they won’t notice? Feel free to let me know what you think, but please don’t make fun of my (lack of) poetry writing skills. If you would like to enter the contest, check it out HERE. They will take entries through October 31, 2011. Be sure to check them out on Facebook and Twitter, too! And feel free to buy me a bracelet. I took this picture yesterday at the gym. It's very important to get back NI shape once the kids are back NI school. I'm wondering (1), if they did this on purpose (I don't think so) (2), why none of the staff has noticed because the signs are all over the place, and (3), why nobody else said anything or if anyone else noticed (clearly I didn't want to speak up and say "umm...did you mean to spell 'in' wrong?"). Woohoo! Another week down. I got to thinking the other day and I realized that we only have four more super duper long runs (as in long runs that aren't cutback weeks) until the marathon! 11, 17, 18, 13, 20, 12, 20, 12, 8, RACE DAY. Craziness. I made this my rest day instead. I'm not sure why but I think it had something to do with not having any time/energy to do anything. Walked 2.25 miles in 41 minutes (18:17 pace). I realize this is hardly considered exercising. I wanted to go for a ride, but the radar was threatening storms. Of course, it ended up being a beautiful evening. It was a nice walk and I wasn't really too concerned with going fast or breaking a sweat (clearly). I guess it's better than nothing, right? Did 20 minutes of weights then ran 4 miles in 38:22(9:34 pace) on the treadmill. I'm trying to be better about consistently working weight training into my schedule because I know it's good for me. This made my quads a little sore the rest of the week, though. Ran 7 miles in 1:12:36 (10:22 pace) outside. I felt like I was running a little faster than what my watch said but the warmer temperature and the hills had me fooled (389 ft of elevation gain). Did 25 minutes of weights then ran 4 miles in 40:16 (10:03 pace) on the treadmill. Ran 15 miles in 2:50 (11:19 pace). This was my longest run ever to date. I actually felt pretty good about it. 11:19 seems slow but I think it's right about where we should be. Miles 1-6 were all in the 10's (pretty standard for us when you consider that we walk for 1 minute every 10 minutes), then miles 7-9 hit us with some hills. For miles 10-13 we were fairly consistent yet a little bit slower. I think by miles 14 and 15 we were just straight up tired and ready to be done. But we kept going and that is what's important. I have no other goal/expectation except to finish, so I really shouldn't pay too much attention to how fast or slow we're going. In all honesty, I think our slower pace and regular walking breaks is (1), why I'm able to go this far and (2), why I was still functioning after my run and why I wasn't too sore the day after (with my new compression socks and sleeves also being a contributory factor). I was certainly tired, but I could walk and go up and down stairs with no problem. Another reason we might have gone a bit slow was that it was so. stinkin'. humid. When we started out it was 73 degrees and 91% humidity. I'm thankful it wasn't hot, but 91% humidity is downright oppressive. I was soaked after a mile. After a few more miles, if I looked down sweat would pour (not just drip) off the end of my hat. It was disgusting. Over the course of the run I consumed 78 ounces of nuun and while I was stretching out after I was done I drank about another 20 ounces of water. I consumed 3 Gu gels (@ miles 4, 8.5ish, and 12ish). On the way home I ate another one. I made it a point to drink plenty of fluids the rest of the day and I refueled with some oatmeal topped with raisins, honey, flax seeds, vanilla protein powder, and soy milk when I got home. I took my 20 minute ice bath and I was ready to go for the rest of the day (although I was a little tired...). I'm thankful that this upcoming weekend is a cutback week - *only* 11 miles! P.S. Don't forget about my Achiva Native Energy giveaway! Last week I received a tweet from Tori at Achiva Native Energy. The tweet simply stated, "We are a Chia Seed based sports nutrition company focused on improving the performance of ALL athletes. Find us at achivaenergy.com"
"Achiva Native Energy Chia Chai Tea mix is the perfect blend of chia seed, coconut water powder, unrefined demerara sugar and our own chai tea blend. This combination offers the perfect balance of carbohydrates, proteins and fats as well as natural electrolytes (magnesium, potassium and sodium). One scoop of this delicious, all-natural mix will get you on your way and will provide the sustained energy needed to keep you going. Whether you are a weekend warrior or training for your 20th marathon, Achiva Native Energy will help you reach your potential." Sounds good to me - sign me up! I asked if I could try out their product and do a review and giveaway on my blog and two days later I received my own bag of Achiva Native Energy. "First and foremost our recipes contain a minimum number of ingredients and each ingredient is all natural." This is always a plus for me. If you can't pronounce half the stuff on the ingredient list, it's probably not the best for you. I'm not one to talk though because I definitely eat way more un-natural things than I should. Ingredients in Achiva Native Energy: chia seeds, demerara sugar, coconut water powder, chai tea blend, sea salt. Sounds pretty natural to me! Nutritional Info: 1 scoop has 70 calories, 3 grams of fat, 10 carbs, 7 grams of sugar, 3 grams dietary fiber, and 2 grams of protein. There are 13 mg sodium and 40 mg potassium. "Chia is a very unique seed that benefits athletes in two specific ways. First, the calories that you get from them come from balanced sources. These little seeds provide energy from carbohydrates, protein, and fat. The carbohydrates come in the source of easily digested soluble fiber, the protein comes from the most complete amino acid profile you can get from a vegetarian source, and the fats come in the source of super healthy omega 3s. This balance insures that you will not get a quick hit of energy that will burn off quickly. Instead, you will get energy from a sustained energy source that easily digests. Secondly, chia has the ability to absorb more than nine times its weight in water. This ability to hold on to water offers prolonged hydration. Fluids and electrolytes are critical to exercise. Your body regulates their concentration and composition in order to maintain the proper balance. Chia seed helps your body retain moisture and more efficiently regulate the body’s absorption of nutrients and body fluids, thereby maintaining the electrolyte balance." "We take a chia seed base and combine it with other important ingredients; including unrefined sugar, dehydrated coconut water, and sea salt. The unrefined sugar provides the initial energy that you need to get going. Combined with the chia seed, the sugar should digest at a slower rate and provide more prolonged energy. The coconut water is an excellent source of natural electrolytes, especially potassium. This is important because potassium plays a critical role in muscle contraction. Muscle activity can be compromised if potassium levels are low. However, too much potassium can cause electrolyte imbalance. So, we have added some sea salt, which provides sodium, to keep your electrolytes in balance. We hope that you find, like we have, that Achiva Native Energy provides the critical nutritional components that athletes of all walks of life need." After I was all educated about Achiva Native Energy, I decided to give it a try. When I opened the package, I will admit that I was a little sceptical. The packaging suggests mixing one scoop with 12 ounces of water. The packaging also lists a few things to keep in mind and a few suggestions that they make for consumption. First, it reminds you that the primary ingredient is seeds. They've done their best to grind them up, but they will not dissolve. They let you know that there are a bunch of highly chemical and overly processed alternatives available that will dissolve completely if that's what you're looking for. BOO-YAH. (it doesn't say boo-yah on there). Their next reminder is that the seeds act strange when mixed with water, but they remind you not to be scared when it starts to gel up a bit because the gel is what gives these seeds their magic. Next, Achiva suggests giving it 15 to 20 minutes after you mix your drink to allow the seeds to do their thing. This allows your drink to taste smoother, but nutritionally it's all the same! Also, they recommend consuming it 15 minutes before excercising. Since the packaging suggested to wait a little bit, I put the glass in the refrigerator and came back about 20 minutes later. If I'm going to be completely honest, I will say that the looks of this drink in water kind of scared me. BUT, I tasted it anyways and I did really enjoy the taste. The texture wasn't too weird, though it definitely wasn't like drinking a regular liquid (you could tell that there was something in there). I wasn't expecting it to be sweet enough (if I drink any kind of tea I must put 1-2 packets of Splenda in it), but it actually had a nice flavor. However, I didn't enjoy the consistency of it in water and really couldn't get over the way it looked in the water. So, since I'm stubborn one to never give up, I started over. I decided to make a "milkshake" which basically consisted of Vanilla Soy Milk and Dannon Vanilla Greek Yogurt. I added one scoop of Achiva Native Energy and blended it up. MUCH BETTER! Apparently I was only having problems with the consistency in water and the way it looked because this milkshake was delicious and I drank the whole thing and wanted more. The "gelling" of the chia seeds also helped it to be thicker, which made it even better. Before my 7 mile run on Wednesday afternoon, I mixed a scoop with a cup of vanilla soy milk before I went running. I was a little worried about drinking milk before I went running, but thankfully I was fine! I really felt good on my run and I felt like I had enough energy for my whole run (sometimes I get a little fatigued by the end of my mid-week sorta long run). Achiva Native Energy also has 20 mg of caffeine in it, so I think that also helped me to wake up for my run. So the bottom line is that Achiva Native Energy definitely has my vote...just maybe not in water. Do you want to try some? Tori has graciously agreed to send a bag to one lucky reader! If you just can't wait, you can purchase a 24 serving bag on their website for $18. You can also find it at these retailers. This giveaway will go through Friday, September 9, 2011, and the winner will be chosen using random.org. The winner will be announced via blogpost on Saturday or Sunday. The opinions expressed above are my own. I was sent a bag of Achiva Native Energy for free in exchange for a review. The winner will be provided a bag free of charge. I won some Tommie Copper calf compression sleeves from Christy @ My Dirt Road Anthem! It’s kind of crazy because I was recently sent a free pair of hot pink CEP Running Compression Socks to try out (my review of them will be coming soon! 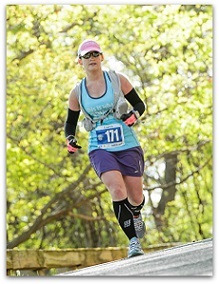 ), and I loved them so much that I ordered a pair of the CEP Allsports Compression Sleeves in black. And what do you know, I won Christy’s giveaway the day after I received my CEP sleeves in the mail. I guess you can never have too much running gear, right? This week went by fast. I feel like my life is so busy and as a result the time flies by. I’m definitely not complaining that the weekend is here, because I’m very thankful for that. And I'm also not complaining about anything in my life that I'm doing - I'm thankful for my job and I'm thankful that I'm able to train for a marathon. But after working all day, going running, fixing dinner, etc., I have about one to two hours before it's time to go to bed! I just wish I had a little more time in my day for other things (sleeping, reading, sitting down with my husband, blogging, etc.). But with that said, if I had 6 more hours in my day I’d probably find a way to fill them up too so maybe it's a good thing that I only have 24 hours in the day because 30 hour days sound exhausting. I’m running 15 miles tomorrow. 15. miles. That’s the longest I’ve EVER run. I’m nervous, but I think we’ll be okay. One mile at a time, right? I’m excited for this weekend. My in-laws are coming in town and we have lots of fun things planned for Saturday and Sunday. AND I get the day off on Monday. Yay! It can be used up to 20 times until September 30, 2011. If something happened to you, would a first responder or passerby be able to contact your family, know that you’re allergic to something, or know that you have a medical condition?